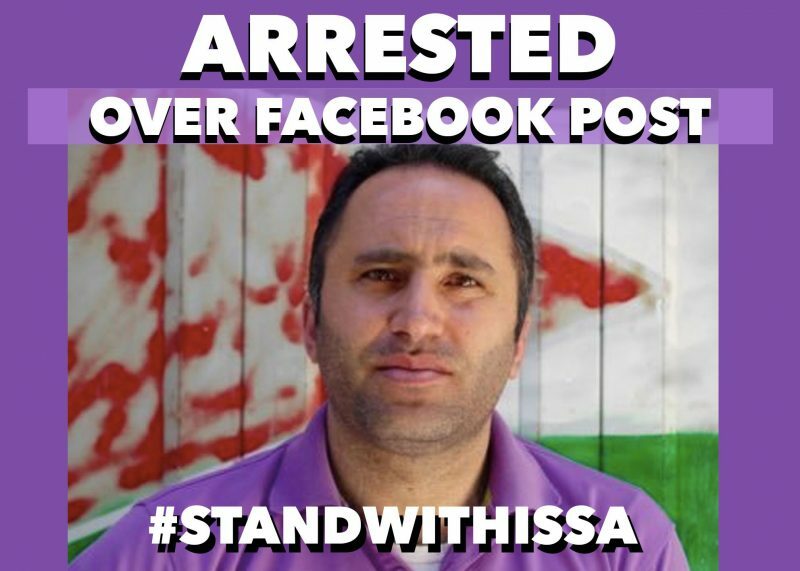 The Palestinian Authority (PA) is continuing its crackdown on free speech in the West Bank, this time arresting prominent Palestinian human rights activist Issa Amro for criticizing a journalist's arrest in a Facebook post. Issa Amro, who is based in the West Bank city of Hebron, is the coordinator and co-founder of the grassroots organization Youth Against Settlements, which documents human rights violations committed by Israeli military and settlers. He is a recognized human rights defender by the European Union and the Office of the United Nations High Commissioner for Human Rights. As one of the more prominent Palestinian advocates for non-violent resistance, Amro also faces legal challenges from the Israeli government. In a separate case before an Israeli military court, he is facing 18 charges, including disputed charges of incitement to violence, stemming from his political protest activities. His trial began on September 3, but was immediately adjourned to October 22. UN human rights experts, Amnesty International and multiple US legislators have condemned the charges against Amro. According to Amro's brother, he was summoned by the Palestinian Preventive Security Forces on the morning of 4 September and officials then interrogated him over a Facebook post, in which Amro had criticized the PA for arresting journalist Ayman Qawasmi the day before. Qawasmi heads a local radio called Manbar al-Hurriya, which was raided by the Israeli army on September 3 and ordered to be shut down for six months due to alleged “incitement”. Qawasmi was later arrested by PA security forces for openly criticizing the PA and calling for the resignation of Palestinian President Mahmoud Abbas and Prime Minister Rami Hamdallah. The actual Facebook post could not be retrieved as Amro's Facebook account is no longer visible on the platform, presumably due to deactivation or deletion. However, a screenshot was saved and published by Youth Against Settlement. In the post, Amro denounced the arrest of Qawasmi and called on the PA to respect and protect freedom of expression and opinion, and its international obligations. 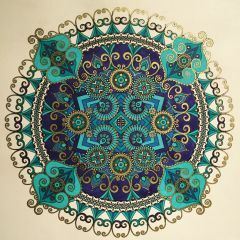 Qawasmi was released on 6 September, but Amro remains under arrest. On 6 September, the Palestinian public prosecutor's office extended Amro's arrest for 24 hours and charged him with stirring sectarian tensions and insulting the PA president, or “speaking with insolence”. All my writings on social media are part of the freedom of opinion and expression stipulated by the Palestinian Basic Law and are protected by all international laws and conventions. My arrest will not affect my defense of human rights and the rights of journalists to exercise their work freely and without pressure from the government. Amnesty International condemned his arrest, calling it a “shameless attack on freedom of expression” and called for his immediate release. “Issa Amro’s arrest is the latest evidence that the Palestinian authorities are determined to continue with their repressive campaign against free speech,” said Magdalena Mughrabi, Amnesty's deputy director for the Middle East and North Africa. The Office of the United Nations High Commissioner for Human Rights also published a statement Monday expressing concern at Amro’s arrest and urging his release. In recent months the PA has stepped up its crackdown on media and press freedoms, and free speech online, arresting journalists and activists, blocking websites of opponents and critics, and adopting a draconian cybercrime law. 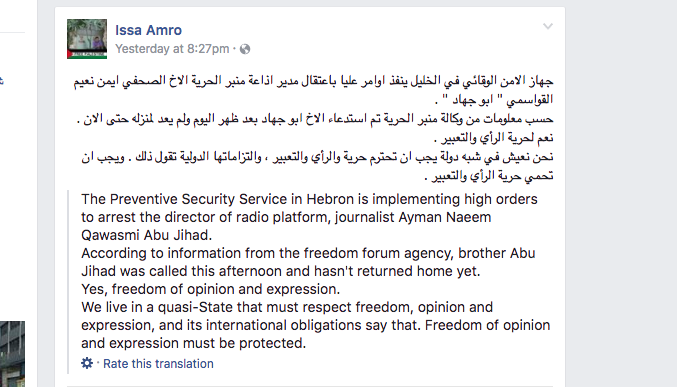 Amro's only crime is that he spoke out against the arrest of Qawasmi and free speech violations committed by the PA. Now he himself has become the target.